John Høybye (1939) is a composer, conductor and arranger. He is an established name in Danish and Nordic choir music life and has conducted a great number of Danish as well as foreign choirs and ensembles at festivals, conventions and classes. Together with his choir TRITONUS he has toured all over Europe, the USA, China, Japan and Brazil, and he and the choir has won several prizes at international choir competitions. As a composer he has made an important contribution to the renewal of Nordic choral music, not least because he combines elements from the "classical" choral sound and texture with elements from gospel- and jazzmusic. Besides his many compositions for adults, he has made several collections of songs and cantatas for children's- and youth choir, now published in Denmark, Sweden, Norway, Germany and England. In 1993 the Danisk Choral Society honoured him as Choral Composer of the Year. 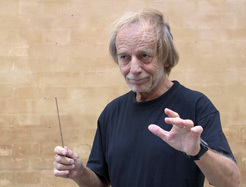 Six years later he was honoured by the Danish Composer's Society who gave him the "1999-prize". 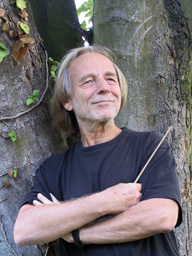 John Høybye has directed workshops and courses with presentaion of his own music in Sweden, Norway, Estonia, Russia, England and Germany. He was a member of the artistic committée and one of the composers writing a commisioned work for the World Symposium on Choral Music (Copenhagen 2008). Right-click to see each photo in high resolution.